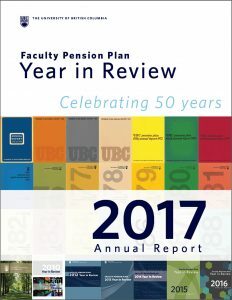 The UBC Faculty Pension Plan’s annual report, 2017 Year in Review, is now available online. The report celebrates the Plan’s 50th anniversary with plan highlights, membership and financial statistics, fund and investment managers’ rates of return, and a market commentary. The Plan’s audited Financial statements are also available to view online.